Finished Size 14” circumference, 15¾“leg length, and 11¾” from back of heel to tip of toe. 100% merino wool; 175 yd 160 m/3½ oz 100 g): #63 candy apple red (MC), 2 skeins; #67 sea foam (CC1) and #30 cream (CC2), 1 skein each. Needles Size 4 (3.5 mm): 16” circular (cir). Size 5 (3.75 mm): 16” cir and set of 4 double-pointed (dpn). Adjust needle size if necessary to obtain the correct gauge. Notions Markers (m); waste yarn; tapestry needle; embroidery needle. Gauge 24 sts and 30 rnds = 4” in St st on larger needle; 25 sts and 25 rows = 4” in charted patt on larger needles. 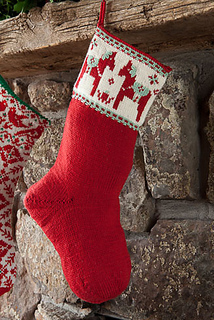 Toe up stocking with a dalahast horse motif border.